If your Porsche endures collision damage, you want auto body repair specialists who are certified by Porsche and committed to the exacting standards that went into the engineering of your car. Brennan Bodyworks is Orlando's independent collision center certified by Porsche to perform auto body repairs to their full line of sports cars and SUVs. We have met the exacting standards required by Porsche in training, equipment, facility and commitment to customer service, assuring you of the expertise needed to return your car to manufacturer's specifications. Since 1983, Brennan Bodyworks has combined classic craftsmanship with skills in the latest materials and techniques to restore damaged Porsches to the pre-collision quality their owners so meticulously maintained. While you can take your car to any auto body repair shop, repairs that are not performed using the correct procedures specified by Porsche may not result in restoring your car to its original standard of performance and style. And the car may not provide the same original safety margin if there is a subsequent collision. 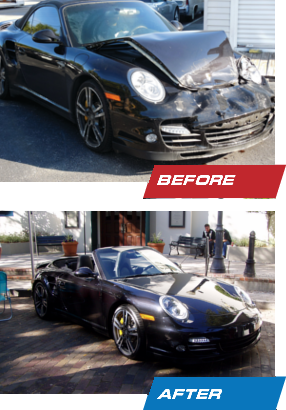 Whether the problem is parking lot rash or major collision damage, you deserve the skilled Porsche auto body repair services you will get at Brennan Bodyworks.